Sir Richard Branson, founder of the Virgin Group, which includes Virgin Mobile and Virgin Airlines amongst others, has a dream of civilian space flight. Keep in mind this wouldn’t only be for the filthy rich, but for the everyman. Yes at first it would be ultra expensive but after time he hopes the price will come down. 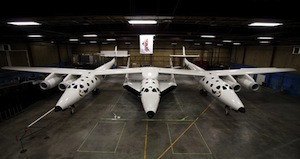 If you remember back in 2009, Branson unveiled his entrepreneurial venture Virgin Galactic Space Travel, which he said would allow to become an astronaut for a mere $200,000. 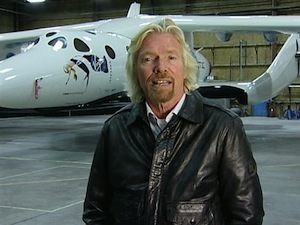 The airship named Spaceship Two, will be carried by the VMS Eve, or the mother ship, named after Branson’s own mother. The journey starts with two spacecrafts traveling 11 miles or 50,000 feet into the air, after which Spaceship Two will release and be propelled into space by its own rockets. 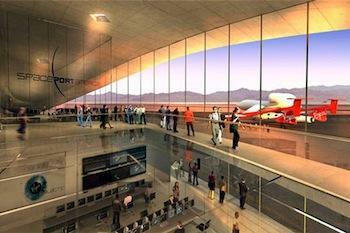 Well this dream has taken one step closer to reality recently as Richard Branson has opened the runway to his Spaceport being built in New Mexico. In fact the entire Spaceport is about half way completed and the Spaceship has made a commemorative fly by with many onlookers including New Mexico Governor, Bill Richardson. Branson states that the Spaceship is entering it’s final test program and there will be a twelve to eighteen month test flight period. There have been 370 people who have dropped $20,000 deposits for the right to fly in space and Branson says he and his 90 year old parents will be some of the first travelers. With the economy in shambles one may wonder, who is paying these exorbitant fees to travel into space for 2.5 hours? “The pioneers of commercial space travel…” consist of the initial deposits, Branson says, but explains the cost is very expensive yet about the equivalent of what it would cost to fly across the Atlantic Ocean on an airplane in the 1920’s. Finally, Branson hopes someday to build a hotel in space and offer individuals and families the ability to vacation in the great beyond. Branson admits hotel stays are pretty far off in the future, but looks at people paying the Russians up to $25 million to spend some time at the International Space-station as a sense of the possibilities. Can you imagine not to far into the future sitting down with you family and debating whether the next road trip will be to Disney World or to outer space? Assuming money was not an issue how likely would you be to take a trip in space with the good folks from Virgin Galactic? I personally think it would be awesome but for $200,000 the inflight snacks better be gourmet.